Valentine's Series (no: 70892) Found here. In October I introduced you to the work of John George Brown, the Bootblack Raphael. Brown attended art classes in Newcastle run by William Bell Scott during the period 1845-52. Brown, specialising in images of children, workers and the poor, went on to great celebrity in New York. Ralph Hedley also attended classes at the Newcastle School of Art. His period at the school lasted from 1860-64. These were the last three years of Bell Scott’s time in Newcastle and the first year of the new master William Cozens Way. Hedley, specialising in images of children, workers and the poor also progressed to some celebrity albeit limited to the North East of England. In his 1895 self-portrait we see the forty seven year old artist framed in a mirror. The mirror is on a stand sitting on the top of a chest of drawers, or table. Beside the mirror is a partially concealed still life: an ornate vase with brushes not flowers casually placed inside it; a hat; a pair of gloves; a small bottle of oil; matches and a pipe. Behind is a basic frame. The artist is lit from one side, he is wearing an elaborate collar and he holds a palette and more brushes in his left hand. He has a moustache and goatee beard and his hair is fashionably tousled. Although Hedley was now a success in local terms and a regular exhibitor nationally he continued to run the carving business. His presence in the studio was as a result part-time: it is fitting then that the self-portrait captures a night-time scene. Hedley extols himself to be direct, to attack the painting in a straightforward way. The artist should truthfully respond to nature, rather than conceal it beneath trickery and technique. However the technique of this truthful approach concerned him greatly. • 1848 Born Gilling West, North Yorkshire, 31/12/48, parents Richard and Ann Hedley. • 1864 Ends time at Art School receiving a certificate and a glowing reference. • 1869-70 sets up his own business with James Wishart. Hedley first went to the school as a twelve year old. Most of his class mates would also have been young boys. Some of the boys were “students” but the vast majority were already at work in trades. The annual report for 1864, for instance, tells us there were among others glass stainers, engravers, coach builders, plasterers, upholsterers and engine fitters taking classes at the school. Hedley and his colleagues went to the school not because they had a burning desire to be artists but to acquire the drawing and design skills which would allow him to follow in the footsteps of men like Ralph’s father Richard Hedley, a skilled carpenter. At some point in the year 1850 the Hedley family arrived in Newcastle from North Yorkshire to start a new life. The attraction of Tyneside was the promise of jobs in the rising industries. Richard Hedley would soon be working as a builder. As the nineteenth century drew on the Tyne became increasingly industrial. Tonnage of goods and materials carried on the Tyne would increase fivefold from 1834 until 1912. There is no record of how the Hedleys arrived in Newcastle. Perhaps like earlier travellers, carpenter Richard Hedley, his wife Ann and their two year old child Ralph caught their first glimpse of their destination from a wagon rolling through Gateshead and down to the old bridge across the Tyne. The “dense population” of the old town increased dramatically from the 1840s onwards with influxes of migrants from Ireland, Scotland and other parts of England. We now know that, like the Hedleys, many came as family groups. Richard Hedley and his family lived in the new suburb of Elswick, then fast expanding. We know from Bell Scott’s correspondence that by 1860 the Newcastle School of Art was well-established having paid off debts incurred earlier. There is also some indication that despite Bell Scott’s personal teaching style, the school conformed to national standards and expectations. We know from his letters that he showed an interest in the careers of a number of his pupils and assistant masters. His classes were conducted on the basis of inspiring the pupil to practice their skills out with the school. This was unusual. Bell Scott was one of a number of masters who admitted that he favoured giving pupils individual attention, a variety of tasks and encouraging them to work between lessons. However the young boys engaged in little that we would recognise today as creative work. They were taught how to copy, diligently and to order. In 1860 Bell Scott delivered a course of lectures which set out the rules of design, colour and art. It is unlikely that the twelve year old Ralph Hedley attended these but they were subsequently published and used as a textbook in the Government Schools of Art: Half-Hour Lectures on the History and Practice of the Fine and Ornamental Arts. Ralph Hedley was a government art school boy working his way through the stages of instruction. In its final version there were twenty three stages of instruction. A watercolour exists dating from 1864 [Art School Study (Still Life)] which shows him to have been an accomplished student. This was probably in fulfilment of Stage XIV, “painting (general) direct from nature: a. Flowers or still life in watercolours…” Stage XIII was to copy a standard example of such art. He may not have completed the nine further stages of instruction. Ralph Hedley’s day work before 1863 was various: a newspaper office, a grocer’s, a hairdresser, an engine works. “Polytechnics” had been held in Newcastle in 1840 and 1848. These were spectacular displays of art, machinery, natural history and science. During the 1850s shows dedicated to art alone were rarely attempted by local committees or artists. It is incorrect to give the impression that there were no art exhibitions in that time. An active exhibition organiser in this period was the master of the Newcastle School of Art who supervised travelling exhibitions from the Government Science and Art department. These were occasionally supplemented by work from local collections: so for instance there was a Government Loan exhibition in 1850 and a Travelling Exhibition from Marlborough House. Bell Scott also regularly showed student work on the school premises and he showed each of his Wallington Hall paintings in Newcastle before sending them to Wallington. There was also a major show in Sunderland in 1860.The young Ralph Hedley would undoubtedly have seen some of these shows. The September 1866 exhibition was however the first major exhibition in Newcastle since Hedley’s art school days. The exhibition was a fund raising exercise for the premises of the New Bridge Street Mechanics’ Institute. It was to be “EDUCATIONAL.” It included a programme of lectures and there were cheap days when it was expected the working man and woman would attend. There were more than five hundred works of art on show and there were numerous tables with objects of historic and scientific interest. The exhibition was also an opportunity, like many such Victorian gatherings, to rehearse the story of art in the North East. Bewick, Clennell, Gray, Martin, Stansfield, Perlee Parker, Nicholson and Carmichael were all celebrated, as was more recent resident William Bell Scott and the young Henry Hetherington Emmerson.The idea of there being a Northern, North East or Newcastle school lay behind the local art display. There were also paintings by Turner, Holman Hunt, Madox Brown and Millais and in the photography section there was a portrait by Julia Margaret Cameron as well as examples from Mawson and Swann. In March when the show was first publicised the Daily Chronicle had at some length berated the town for its poor taste and its lack of a permanent gallery of art. The Chronicle’s plan was to spread the good work which the School of Art had begun into the general population. To Twenty-first century readers the Daily Reports issued by the show’s organiser’s seem hectoring and patronising in turns. These were a daily publication acting partly as exhibition guide, partly as advertisement. Relations between worker and employers were strained at this time and this is apparent in the Daily Reports. In 1866, the year before the 2nd Reform Act, there were several labour disputes on Tyneside. Workers were campaigning for a shorter working week. Engineers had been locked out at Jarrow. Strikes and court cases had dominated the news through the summer months. A small recession was underway and at least one company went bankrupt under the strain.ii The new building for the Mechanics’ Institute was behind schedule due to a strike by masons: comments on the opening day highlight the tension which the worker’s demands were causing. The “mechanical orders” were at first slow to turn out to see the show but by the end of the first week their presence was being commented upon favourably. The visits of postmen, jokingly called “gentlemen of letters”, and children from the “ragged school” were given special mention in the Daily Reports. It seems that the issue of special worker’s tickets guaranteed a large attendance, as did special train excursions running from York, Darlington, Hartlepool. On the final day for instance 2,721 people attended. There is no doubt that the young wood carver Ralph Hedley was among this throng. There were articles and letters decrying the faults of the Pre-Raphaelites (an old bugbear as they had been lambasted when their work first appeared in Newcastle in 1850) “Work” by Ford Maddox Brown for instance was said to be too busy, perhaps it should have been three paintings the Daily Report writer suggests. The Express took exception to the “Hireling Shepherd” by Holman Hunt: it was a departure from and exaggeration of the elements of art, particularly colour and perspective. Even “Autumn Leaves” by Millais was seen as lacking: the girls were stiff and the leaves artificial. On the 1st October the Fourth notice in the Journal declared that Arthur Hughes would never make an artist and should study the human figure much more closely. G.F.Watts was also warned off painting figures by the reviewer: best to stick to landscape he is told. By the end of the show the criticism of the too meticulously painted Pre-Raphaelites (all from Leathart’s collection) had become a matter for some after-dinner jocularity. Emmerson, a one-time star pupil of Bell Scott, replying to a toast from Leathart to the artists, said he would not go into “details” as he was not a Pre-Raphaelite. The young Ralph Hedley would have walked away from the Town Hall in October 1866 with the impression that art was important, moral indeed; that challenging and unusual art was little appreciated in the town; that art had a strong local history; and that there might be a place in the art world for the talented painter whatever his background. 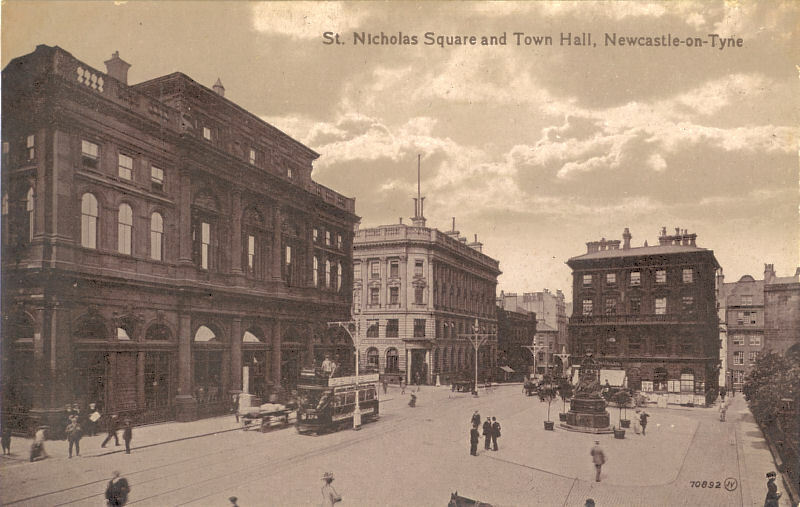 In Newcastle the immediate impact of 1866 was the opening of the Central Exchange Art Gallery as a subscription reading room and art gallery in which Barkas and his partner Thomas Tweedy showed rolling exhibitions of art, science and curious objects. The gallery had a high profile through constant advertisement and notices in the local press. Paintings ancient and modern were on show. A reputed Titian appeared in May 1871, for instance. Henry Hetherington Emmerson was the first of the local artists to use the Central Exchange as a way of publicising his activities: paintings would appear there before being sent down to London. Notices in the Newcastle Daily Journal could be lengthy: such as the attention paid to “The Branks” in 1873. The Central Exchange was a commercial venture relying on subscriptions, sales of art work and special events to finance the building. Ralph Hedley is unlikely to have been a regular visitor: there were only two thousand or so subscribers. However he was there during the opening exhibition with his partner James Wishart, demonstrating wood carving. The given subject was political and topical: the warring heads of state of France and Prussia.